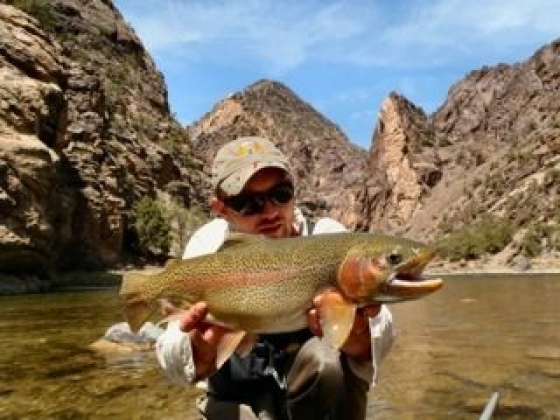 Black Canyon Anglers is a fly shop, guide service, and lodge. 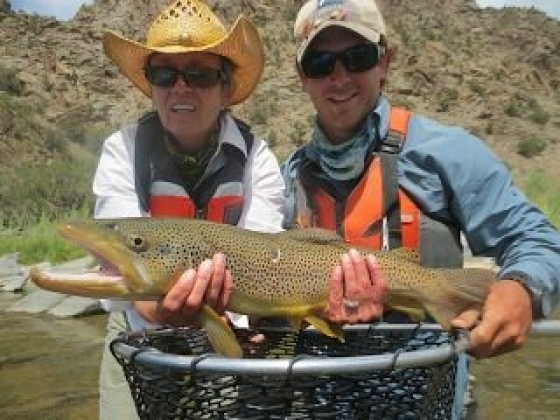 We specialize in one, two, and three day float fishing trips down the Gunnison Gorge section of the Black Canyon. 2014 is our 30th season in business. The Gunnison River is most well known for its large 20' plus Rainbow Trout and the highest number of brown trout per acre foot of water in the state. The Colorado Department of Wildlife routinely conducts fish surveys on the Gunnison River, the last survey showed over 10,500 fish per mile give or take 1100 depending on the mile. BCA is the largest and most experienced outfitter in the Black Canyon and offers the only fishing lodge on the Gunnison River. Our Black Canyon of the Gunnison fishing trips start and stop at our lodge which is located 30 minutes from the Montrose airport (MTJ) on the western slope of Colorado. Most of our clients stay with us the night before the trip to fish our private water, have a great meal, stay in our cabins, and enjoy the property. Our clients are each given a waterproof dry bag backpack which they will use to pack their personal gear. They will hike this gear down the trail the morning of the trip unless otherwise arranged. We also offer rentals; anything you might need for the trip is available. The next morning we will wake you up at 5:30, at 6:00 you will meet your guides and have breakfast. We try to leave the lodge by 6:30. Everyone will load into a 15 passenger van, we will then drive 30 minutes on a paved road and 45 minutes on a rough 4x4 road to the hiking trail. The hiking trail is a moderate 1.1 miles long, all downhill to the water where you will find the boats and coolers. The night before the trip we drive down the same trail to meet the horses and mules that walk in 8 miles each day, we load them up with gear, and they spend the rest of the day packing this gear to the water. Two days before the trip all the gear is loaded into a van and the fresh produce for the trip is bought and stored at our facility. Once we reach the water the guides will rig the boats and load your personal gear. 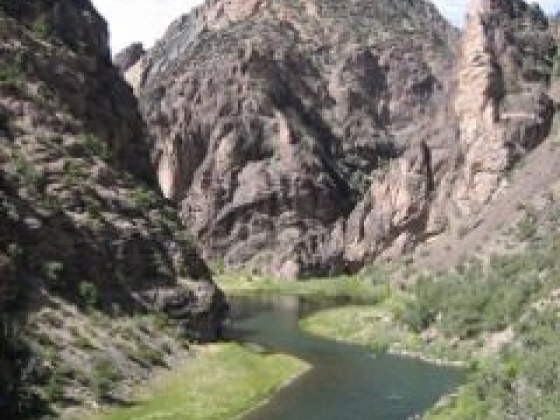 We then spend the next one, two, or three days covering 14 miles of the Gunnison River. We will only fish from the boat on a one day trip. On a two or three day trip we will spend more time out of the boat than in the boat and you will make a riverside camp each night. At the end of the trip we back the van to the water, load the gear, and drive 10 minutes back to the lodge where most of our guests will take showers, have dinner, and stay in our cabins. Our Black Canyon of the Gunnison guides are not your average guides. It takes a special person to row you down the river safely, cook breakfast, lunch, and dinners, set up a different base camp each night, and retain the geology, wildlife, plant, and fishing knowledge required of this trip. We have high standards set for our staff and they work very hard to create the best trip they possibly can. Black Canyon of the Gunnison Fly Fishing Lodge The lower Gunnison River wraps around the property and allows for private water fishing access. You can also enjoy our two stocked trout ponds. We have petroglyphs (Native American drawings etched in rock) on the property as well, dated back 4000 years, just a short walk from the cabins. The cabin cost is $200 per person per night. This includes a continental breakfast the next morning and access to our private water (large section of river and 2 stocked ponds). Our dinners include happy hour, appetizers, salad, main entrance, and dessert with beer and wine served.